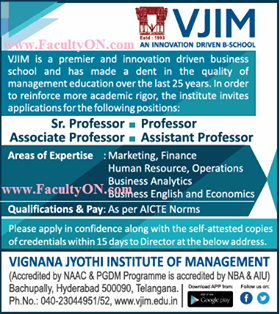 Vignana Jyothi Institute of Management, Hyderabad has advertised officially for the recruitment of Professor/Associate Professor/Assistant Professor jobs vacancies. Interested and eligible job aspirants are requested to apply with in 15 days. Check out further more details below. About College: Integrate classroom learning with industry exposure to ensure the application of knowledge during the course of study it self. VNRVJIET focuses on high quality education and research in the fields of Science,Technology and Engineering.